What happens is that all that post market activity is part of the trading activity for the daily bar (image left). 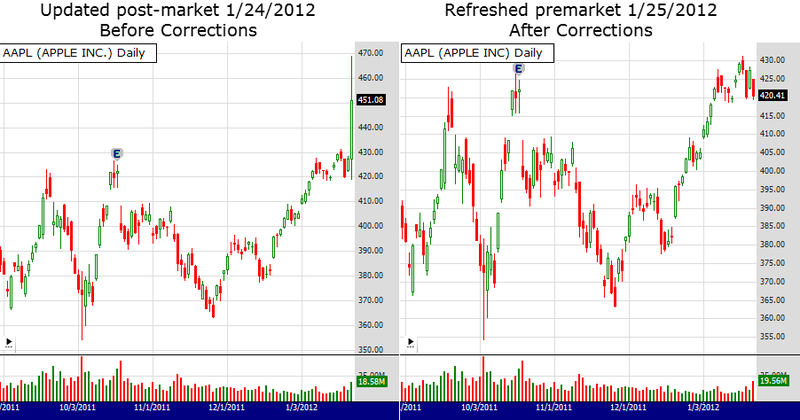 Corrections are not applied until the early morning hours (image right). Although I don't know all the details of what actually goes into to the corrections, it's clear that the corrections filter the activity after the 4pm close. The problem is that if you update WLPro during the evening without corrections, you won't be able to obtain the corrections until after the close of the following session. That's because once the Fidelity Provider thinks its EOD data is up-to-date, it doesn't try to update it again until the next session. My current recommendation would be to avoid updating Fidelity EOD data until 6am the following day so that corrections are applied during the first update. Otherwise if you run a strategy on data that changes from one day to the next, you risk getting trading signals that appear one day, but disappear the next. That's because once the Fidelity Provider thinks its EOD data is up-to-date, it doesn't try to update it again until the next session. ...but it can be forced to update (and to grab latest corrections) by truncating the last bar before updating. [QUOTE]That's because once the Fidelity Provider thinks its EOD data is up-to-date, it doesn't try to update it again until the next session. [/QUOTE] ...but it can be forced to update (and to grab latest corrections) by [LINK=/Extensions/Details/WealthLabAddinDataTool-27]truncating the last bar[/LINK] before updating. Thanks for that, it's a good stop-gap measure until the Fidelity Provider EOD update behavior is changed. ... if you update WLPro during the evening without corrections, you won't be able to obtain the corrections until after the close of the following session. ... current recommendation would be to avoid updating Fidelity EOD data until 6am the following day so that corrections are applied during the first update. I'm assuming 6am means Wall Street Eastern Time (ET). When I see corrections in the update log for EoD bars, I only see them one bar back. So I'm assuming for EoD bars, the Fidelity data connector is only requesting the last two daily bars and correcting just the previous one if necessary. Is this correct? If so, that means all other bars aren't checked (although the older bars probably are all correct anyway). [quote]... if you update WLPro during the evening without corrections, you won't be able to obtain the corrections until after the close of the following session. ... current recommendation would be to avoid updating Fidelity EOD data until 6am the following day so that corrections are applied during the first update. [/quote]I'm assuming 6am means Wall Street Eastern Time (ET). When I see corrections in the update log for EoD bars, I only see them one bar back. So I'm assuming for EoD bars, the Fidelity data connector is only requesting the [u]last two[/u] daily bars and correcting just the previous one if necessary. Is this correct? If so, that means all other bars aren't checked (although the older bars probably are all correct anyway). I think it's 3 bars back, but right, other historical bars are not checked (it would practically defeat the purpose of having the bars cache). Don't always assume that. Before serious testing, especially with Fidelity data, run the "Bad History Data Check Rev. A" - see Description for instructions. You're likely to find gaps in data around or before 2000, and attempting to correct those errors will be futile. However, other gaps seem to creep into Fidelity data and if you find gaps in data after 2001, it's a good idea to refresh those symbols. I think it's 3 bars back, but right, other historical bars are not checked (it would practically defeat the purpose of having the bars cache). [quote]although the older bars probably are all correct anyway[/quote]Don't always assume that. Before serious testing, especially with Fidelity data, run the "Bad History Data Check Rev. A" - see Description for instructions. You're likely to find gaps in data around or before 2000, and attempting to correct those errors will be futile. However, other gaps seem to creep into Fidelity data and if you find gaps in data after 2001, it's a good idea to refresh those symbols.